We are pleased, that you have found your way here. 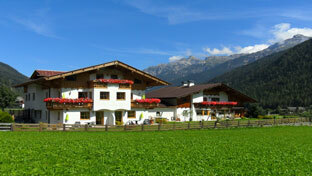 Our family-run guest house in Neustift/Stubaital is situated in a quiet and central part of Milders. We offer 7 well furnished holiday apartments in different sizes (27-80m²), a generous spa area, a play room for the kids, a computer room, WLAN in the holiday apartments and many more for the most pleasant days of the year. -certification - the highest honor for Holiday-Flat Landlords. Our guest house offers a magnificent view of the Stubaier Glacier. ... click here, to enlarge the map . Weitere Infos zum Skigebiet Stubaier Gletscher.